Features: This is software that trains you in speed reading, reading fluency, vision training etc. You can get reading assessment and an online reader software. You can a mass of emails, need to read a bunch of web pages, textbooks, documents and so on. The sooner you can get through the mass or reading material yet it is not easy to increase your reading speed. AceReader Pro provides you with three tools that are a training tool that will help you read faster both online and offline., an assessment tool to assess and track your reading speed achievements and an online reading tool to help you read more efficiently while online. The program uses Tachistoscope technology to pace eye movement. This can break the bad habits that limit our reading speeds. These are sub vocalization and regression. Sub vocalization is the habit of reading out loud what you are reading and regression is to make eye movements that go back over the line you are currently reading. Training activities include timed reading comprehension Tests, eye pacing drills and eye exercise games. The program includes several levels of reading material for many grades. 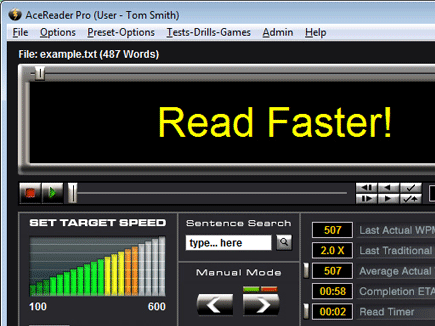 Drills automatically adjust training speed relative to your personal reading ability. The program logs and graphs results for your information. There are three ways to use the program: (1) Course Mode, (2) Menu Mode, and (3) Expert Mode. The Course Mode walks you through a self-adjusting automated course. The Menu Mode gives you more control by allowing you to pick and choose from a menu of training activities. The Expert Mode gives you full control by allowing you to load your own content. Overall: This is an excellent program for improving your reading speed. VERSION INFORMATION: Four versions of this product are available: (1) AceReader Pro (single user home edition), (2) AceReader Pro Deluxe (multi-user/family edition), (3) AceReader Pro Deluxe Plus (single station school edition), and (4) AceReader Pro Deluxe Network (network school edition). Accesses and optimizes the Internet connection.